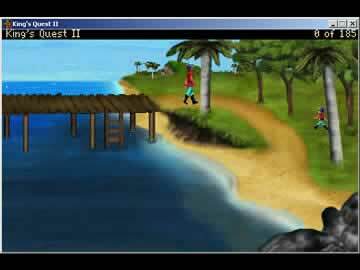 King's Quest 2: Romancing the Throne Game Review - Download and Play Free Version! Challenging tasks that stretch the imagination. Creative story line and plot elements. Brisk walking pace that allows for more rapid progression to different areas. Graphics are sub-par due to their release date (1985-1987). 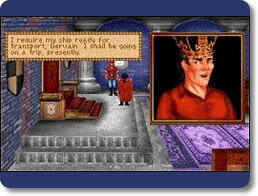 Sir Graham, the hero of the original King's Quest, is now ruler of Daventry. Although the land is at peace, King Graham is lonely. After looking at his magic mirror, he sees a vision of a beautiful woman in distress who just happens to be pretty enough to resuce. Donning his sword and adventuring hat, the king travels to a far off land, full of danger and surprises, to search for his bride. 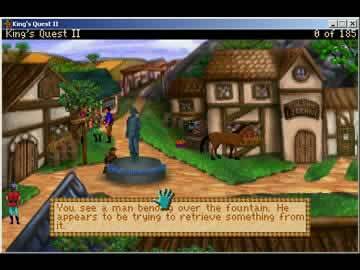 King's Quest 2 is a fantastic point and click adventure game. The graphics are great considering it was originally made in 1985. The puzzles are fun and the story has a load of chuckles woven in. Definitely worth the download. Stuck in the game? Check out this walkthrough. This sequel to the legendary first release of King's Quest that practically invented the casual point-and-click adventure genre follows in the footsteps of its predecessor as a remarkable journey back in time, only now Sir Graham has become King of Daventry and must embark on a new, more deadly quest....he needs a woman! Lonely in your practically empty castle, a magic mirror reveals a beautiful damsel whom who decide to gallantly rescue from the perils of an evil witch who cursed said maiden to an enchanted tower. Creativity abounds in the fantastical land of Kolyma, primarily in the characters met; talking pumpkins, a big bad wolf and little red riding hood to name a few. It will take many hours to reach the conclusion of the game which makes it especially valuable, and the speed at which Graham moves is uncharacteristically rapid which allows for a quicker pace that does not interrupt the overall length of this release. The only weak elements are the graphics, which are a product of their 1980s release date, and the background music which tends to be rather dull. However, neither of these features are terribly bothersome and Romancing The Throne proves an excellent edition to the many King's Quest releases offering a fantastic tale with challenging tasks that will last countless hours. Catch a peek of the point-and-click gameplay and one of the hidden easter eggs which can be found in King's Quest 2.